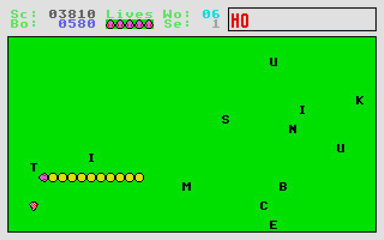 This is actually a remake of the Hiss game that was written for the BBC/Electron computer, albeit in a bigger playing area and more colourful (although the colours went a bit weird when ran through an emulator, so aren't how they were originally on the ST). AlphaSnake is basically a Snake game with an educational twist... instead of collecting fruit and the like, a player is given a word to spell and then has to guide the snake over the letters of the word in the correct order. The idea is that it's an educational tool for young children to teach them how to spell. It was also fun for adults once the game speed was cranked up a notch or two! Note that the download only contains the source files and is not supplied in an executable form. You will therefore need a copy of GFA BASIC 2 to run the game.